Avoid The Negative Consequences Of Sitting Too Much! Too much sitting can have serious negative consequences for your health. Even if you get regular exercise, it may not be enough to overcome the health problems. But, you can avoid these health problems. In this article, we’ll take a look at six easy-to-implement changes you can make to your routine to get healthier and avoid the consequences of too much sitting. Are You a Typical Business Executive? How much time do you spend sitting every day? You sit at your desk to read and write. You sit in meetings. You sit to review orders, requests, and P&L reports. If you travel you are sitting in taxis, on planes, trains, in lounges on layovers. Yes, you do walk, some, around the office, to the meeting room, to and from your car. But really, how much of your day involves walking? As a successful businessperson, you have plenty to do and too many demands on your time. You still can find time to get the exercise you need to be healthier and live longer. Have you ever tried working out at work? We propose 11 ideas to get started. The fact is sitting is killing you. A study in the Annals of Internal Medicine looked at 47 other studies of people with “sedentary lifestyles,” i.e., they spent a lot of time sitting. In other words, even if you exercise regularly, but spend a lot of time sitting, you are still at high risk of serious health problems. We understand that your work requires you to be at a desk. We know you don’t have time to join a gym. We have strategies, tips and advice to help you get the most from your work day and still get the exercise you need. Since you are a busy and successful person, we’re not going to waste your time. Here are the Books you need to arrive at the correct decision. Let’s put this another way. Sedentary lifestyles increase the risk of cardiovascular disease. “For people who sit most of the day, their risk of heart attack is about the same as smoking,” said Martha Grogan, a cardiologist at the Mayo Clinic. “Today, our bodies are breaking down from obesity, high blood pressure, diabetes, cancer, depression and the cascade of health ills and everyday malaise that come from what scientists have named sitting disease,” said James Levine, MD, Ph.D. and a noted expert on the problems with sedentary lifestyles. 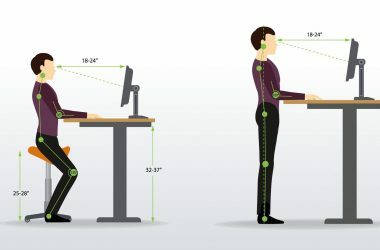 US News & World Report took a hard look at “sitting disease.” The problem is muscles need to be used regularly and often. Sitting for long periods leads to a host of health problems. Two minutes of walking around the office while you are on the phone is all you need. Getting the exercise you need is easier than you may believe. Don’t sit for more than an hour. Get up. The Express says 5 minutes of walking can undo arterial damage done by sitting for three hours. The study referenced in the article also points to the problem. Slack muscles don’t pump blood as effectively as muscles that are moving. 1. Get a Desk Exercise Bike. Fitting perfectly into your work style, a desk exercise bike help you burn calories without leaving the desk and lose weight. If you have to meet, have standing meetings. This guarantees the meetings will be shorter and more productive too. BONUS! Save time and get more done! 3. Get a Standing Desk for Your Office. Arrange it so you can stand and sit. Authority Nutrition says standing burns more calories than sitting. And, it makes your leg muscles move, improving blood circulation. It also increases your mental activity and makes you feel more energetic at work. 4. Get up Every 50 Minutes or so and Walk Around for a Minute. Walk to the water cooler. Walk to the window. Walk to the copier. Commit to 12,000 steps a day. For the average person, 2,000 steps is a mile. Work your way up. This includes walking around the office, walking outside the office and walking at home. Even better. Get a fitness band and gain a clearer picture of your physical activity. If you are only going a few flights, walk instead of the elevator. Going upstairs is excellent exercise and, depending on the elevator, may be faster. 7. Any Time You Are on the Phone, Stand. A phone call gives you the perfect excuse to get up. Standing also means you won’t be on the line nearly as long. More time saved! Just Stand, an organization aimed at getting people out of their chairs says, standing all day is not a good idea. You do need to sit to rest or for heavy concentration. 8. At least Once a Day, Leave the Office for a 15-Minute Walk. Even a short walk like this improves brain function. That means you are sharper when you return to work. Not sure what else to do? We’re here for you. Best of all, you can keep this just between us. Sign up for our free executive fitness advice newsletter and get tips to maximize your workout and maximize your work at the same time. It drops right into your inbox. You can read and put the tips into effect. Do you have another opinion about too much sitting in the office? Or do you use other strategies to avoid the negative consequences of sitting too much? Feel free to share your comments with us. Thanks Judith, having bought a pedometer I realized how little I walk 3000 to 4000 steps a day far away from 10 000 steps goal!